Aircraft flight control surfaces allow a pilot to adjust and control the aircraft's flight attitude. Development of an effective set of flight controls was a critical advance in the development of the aircraft. Early efforts at fixed-wing aircraft design succeeded in generating sufficient lift to get the aircraft off the ground, but once aloft, the aircraft proved uncontrollable, often with disastrous results. The development of effective flight controls is what allowed stable flight. Ailerons are hinged control surfaces attached to the trailing edge of the wing of a fixed-wing aircraft. The ailerons are used to control the aircraft in roll. 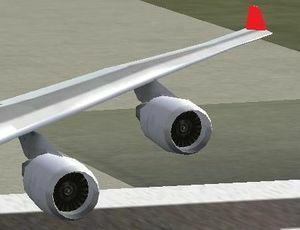 The two ailerons are typically interconnected so that one goes down when the other goes up: the downgoing aileron increases the lift on its wing while the upgoing aileron reduces the lift on the other wing, producing a rolling moment about the aircraft's longitudinal axis. The word aileron is French for "little wing." Wingtip devices, sometimes know as winglets, are usually intended to improve the efficiency of fixed-wing aircraft. There are several types of devices, and though they function in different manners, the intended aerodynamic effect is to modify the aircraft's wake in some beneficial manner. Wingtip devices can also improve aircraft handling characteristics. From a marketing standpoint, they are also valued for their aesthetic appeal, and aircraft have been equipped with them for cosmetic reasons as well. Elevators are control surfaces, usually at the rear of an aircraft, which control the aircraft's orientation by changing the pitch of the aircraft, and so also the angle of attack of the wing. An increased wing angle of attack will cause a greater lift to be produced by the profile of the wing, and a slowing of the aircraft. A decreased angle of attack will produce an increase in speed (a dive). The elevators may be the only pitch control surface present (and are then called a stabilator), or may be hinged to a fixed or adjustable surface called a stabilizer. Flaps are hinged surfaces on the trailing edge of the wings of a fixed-wing aircraft. As flaps are extended the stalling speed of the aircraft is reduced. Flaps are also used on the leading edge of the wings of some high-speed jet aircraft, where they may be called slats. Flaps reduce the stalling speed by increasing the camber of the wing and thereby increasing the maximum lift coefficient. Some trailing edge flaps also increase the area of the wing and, for any given aircraft weight, this reduces the stalling speed. The Fowler flap is an example of one which increases the area of the wing. On an aircraft, the rudder is called a "control surface" along with the rudder-like elevator (attached to horizontal tail structure) and ailerons (attached to the wings) that control pitch and roll. The rudder is usually attached to the fin (or vertical stabilizer) which allows the pilot to control yaw in the vertical axis, i.e. change the horizontal direction in which the nose is pointing. The rudder's direction is manipulated with the movement of foot pedals by the pilot. This page was last modified on 14 February 2016, at 13:16.